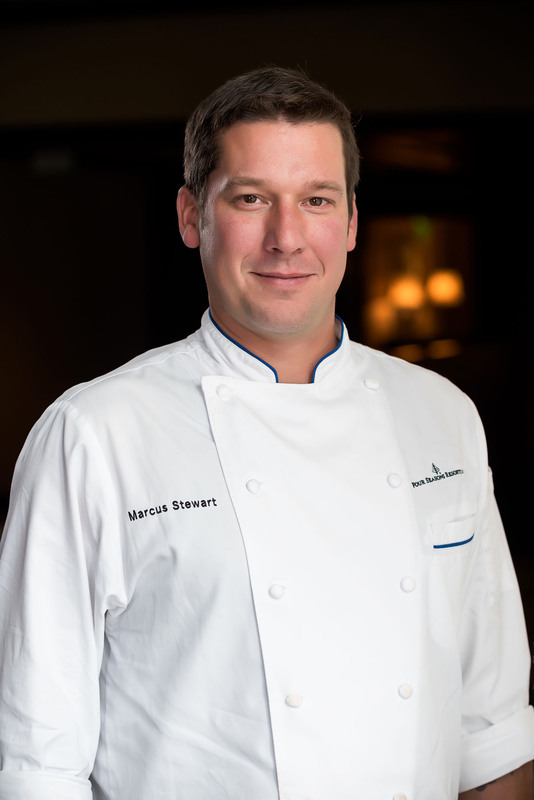 One of our favorite places in the mountains is Four Seasons Resorts Vail, where Executive Chef Marcus Stewart oversees all culinary operations on property including Flame, The Remedy, the Burger Bar, Pool Bar, and In-Room Dining. Nothing comes out of one of his kitchens that isn’t spectacular, and we’re proud that he continues to feature 7X on his menus. Chef Marcus took a little time out of his schedule to answer a few questions for us. What’s your guiding passion when it comes to food? Food is LOVE. Eating is an essential part of each of our lives. We all must take nourishment from somewhere or something. It is the one fundamental thing that binds us all and there is no pleasure in life that is better than sharing that love with other people, whether in your home or at your place of work. Can you describe your style of mountain cuisine? From fine-dining to fun dining, our mountain restaurant embodies the essence of family style modern steak. Large cuts, table side salt block carvings, the true essence of steak and the show that comes with it. We have light seafood appetizers, salads, soup, a wide variety of sides to complement the meal, and a proprietary offering of six different sauces that comes with our steaks. We also showcase several different rubs, each a fun play and interesting flavor combination on some Flame originals and worldly classics. What’s your history with beef, and with wagyu in particular? I have re-branded two restaurants, one in Atlanta and another in Hawaii, into steakhouses over the course of my career and have been the chef at 4 different steakhouses. My first experience with wagyu was in Hawaii; we brought in the A5 Grade to Four Seasons Resort Lana’i and everyone loved it! Fridays were always steak night at my house growing up. Some of my fondest memories were of being able to clean the bone of the porterhouse that my dad would buy each week. What do you like about 7X Beef? I like the marbling and flavor intensity of the 7X beef, the sustainable practices 7X uses in raising their cattle and the fact that it’s Colorado-proud (I like to incorporate hyper local products in everything we do here). I am also quite partial to the fact that it’s family-owned and operated; the level of personalized customer service is bar none. I use 7X beef in ALL of my outlets. We also use the 7X beef to create our signature Remedy burger (it’s the best burger in town because of the quality of the beef and the way we prepare it). In Room Service, we have the home style 7X spaghetti and meatballs. And of course in Flame we use a variety of the 7X beef. What is your favorite cut? The New York is by far Flame’s most popular seller. We have it as an 18-ounce center-cut NY Strip and our guests just go crazy over it. Personally as a chef, my favorite cut is the Ribeye because of the fat content. Fat is flavor and I love to char it over an open fire and hear the crack and sizzle. And aligning with the sustainable practices 7X holds dear, we are currently playing with some of the lesser known cuts (such as the short rib, oxtail and brisket) as to not be wasteful of the cow. What’s your favorite preparation? I do these customized spice rub classes where attendees get hands-on experience in creating their own spice. I set up a beautiful presentation of jars containing spices, sugars, herbs, and many other unique flavors that attendees won’t traditionally find in their own kitchens at home. As they explore these new aromas, I guide them through the exciting and intimate process of creating a custom rub that fits each personal palette. The guests then use their sense of smell and taste to select flavors in customizing their own blend, culminating in tasting their creation on a piece of meat of their choice. What are your favorite things to serve with beef? To drink? Whiskey. I like the way the whiskey cuts through the richness of the beef, and the subtle caramel notes in whiskey pairs well with the 7X steaks. To serve with beef? With each one of our steaks, we serve a caramelized pearl onion and mushroom garnish that is slowly caramelized with olive oil, thyme, rosemary, garlic, and a hint of balsamic. The sweetness of the onions and earthiness of the mushrooms complement the steak ever so eloquently.